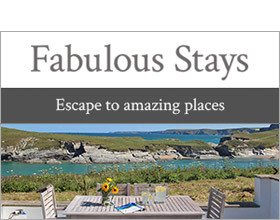 Quentin's is the King of the Castle from where it sits, overlooking the famous holiday resort of St Ives, its picturesque harbour, the white sandy harbour beach and a stunning panoramic seascape over the bay towards Godrevy Lighthouse. Arranged over two floors, this snug top floor apartment has been refurbished to a high standard throughout and offers flexible accommodation for four. Large picture windows in the living room frame this iconic stretch of coastline rated as one of the most scenic in Britain. It truly is a wonderful spectacle during all seasons! The chance to enjoy a morning coffee whilst watching the colourful fishing and pleasure boats leave their anchorage or dine by candle light and watch a dramatic sunset over the Atlantic horizon are all made possible for guests at Quentin's. The harbour and four world class beaches are within a short stroll and amidst the town's narrow cobbled streets are art galleries including the Tate, shops, numerous eateries, old inns and bars. The apartment boasts a contemporary interior, combining fresh white decor and soft beige carpeting with bold luxurious furnishings and, although not hugely spacious, it is versatile and comfortable. The living room with its plump corner settee and access to the small seaward facing private balcony (equipped with a pair of bistro chairs) offer relaxation after fun-filled days exploring the coast. There are two double bedrooms, one with an en-suite shower room and another accessed via a spiral staircase (regrettably unsuitable for the infirm) and set into the eaves. Sat adjacent to a second shower room, the upper floor bedroom enjoys the best views and is equipped with a king size and single bed on low bases. For those bringing a car there is parking for one car and major attractions such as Land's End, St Michael's Mount and The Minack Theatre are within 30 minute drive. Three flights of steps to entrance:Living room with kitchen and access to small balcony. Two bedrooms, 1 x with king size bed and en-suite shower room with WC, spiral staircase to the second bedroom with both king size bed and single with lowered mattresses (because of the reduced head height). Second shower room.